One in four drivers admitted to texting while driving in the past month, a new AAA survey reports. While teenagers often get the most blame, this survey found drivers age 25-39 are actually the worst offenders. Texting while driving is against the law in Massachusetts and 40 other states. 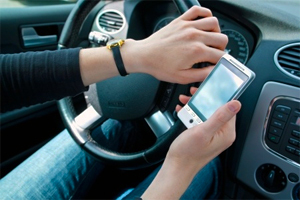 But in the new survey, 26 percent of drivers reported sending a text or e-mail while driving in the past month. Among drivers age 25-39, 45 percent admitted to texting or sending an e-mail while driving and 10 percent admitted they did so fairly often. These drivers were also most likely to drive while talking on a handheld cell phone, with 82 percent admitting to doing so in the past month and 43 percent saying they did it fairly often. Talking on a cell phone while driving is still legal in many states, including Massachusetts, but legislation is pending to restrict that activity. Drivers 19-24 were second most likely to text while driving, with 42 percent confessing to it at least once in the previous month and 11 percent saying they did it fairly often. Drivers age 16-18 were third most likely, followed by drivers ages 40-59, then 60 and older. Drivers age 75 and older were the least likely, but even one percent of them admitted to texting and 31 percent admitted to talking on a handheld cell phone while driving in the previous month. One out of 10 fatal car crashes involves distraction, resulting in more than 3,000 deaths per year in the U.S.
At any given daylight moment, approximately 660,000 drivers in the U.S. are using cell phones or manipulating electronic devices while driving, according to the National Highway Traffic Safety Administration (NHTSA). Using a cell phone while driving quadruples your chance for being involved in a car accident, according to AAA. Talking on a handheld cell phone is banned in 12 states and the District of Columbia. It is legal in Massachusetts and the rest of New England. Cell phone use is restricted for novice drivers in 37 states and the District of Columbia. Texting while driving is banned for drivers in 41 states and the District of Columbia, including Massachusetts. It is also banned in other New England states. Six other states have bans prohibiting novice drivers from texting. Using hands-free devices or infotainment systems is not safer than using handheld cell phones or texting, according to a study by a University of Utah research team. The study last summer tested voice-to-text technology which allows drivers to talk on the phones, send texts and e-mails and use social media without touching a cell phone. The study measured driver alertness using cameras mounted inside the vehicle and diagnostic tools to measure reaction time and brain activity. Researchers ranked voice-to-talk technology as more dangerous than using a handheld cell phone and listening to a radio. We suggest parents now talk to your children about the rules for getting to and from school safely. No skipping over the hard part: talking about when everyone, parents and children alike, should put down the cell phone. Walking to School. Encourage your child to use sidewalks and crosswalks with crossing guards or walk signals. Agree on a route with your child and never let them walk alone. Every year, drive or walk the route yourself so you can identify any problems. Bicycling. Make sure your child wears a helmet – it’s the law and it’s common sense. While your child has many of the same rights as a driver, remind them to take it slow in parking lots or and when passing cars. They should learn to make eye contact with drivers in their vicinity–that way they can read the intention of the driver more clearly. Read about Massachusetts law for bicyclists. A new study raises the question of whether driving while using a cell phone is the safety risk or a symptom of a larger problem: an aggressive driver with dangerous habits. Researchers at the Massachusetts Institute of Technology (MIT) found drivers who engaged in frequent cell phone use are higher-risk, even when their phone is out of use. The researchers studied the behavior of 108 Greater Boston drivers. About half admitted to frequent cell phone use while the others said they rarely talked behind the wheel. The frequent cell phone users tended to drive faster, changed lanes more often and spent more time in the far-left lane. They were also more likely to accelerate rapidly and slam on the breaks. The data supports the focus on cell phone use: The National Safety Council (NSC) estimates about 1 of 5 car accidents involve drivers who were on the phone. But researchers say even as the number of cell phones has increased nationwide, the number of car accidents has not, leading to one possible conclusion that drivers who talk behind the wheel are also engaging in other risky behaviors. Massachusetts is among 39 states which have banned texting while driving. Ten other states ban talking on the phone unless a driver uses a hands-free device. Recently in Massachusetts, lawmakers have considered full cell phone bans to reduce car crashes. Researchers are investigating whether the answer lies beyond new laws. They are considering retraining programs for drivers which discourage cell phone use and provides warning about other bad habits. Focus is also on auto collision warning systems or sensors which identify when cars cross a lane. It’s not the cell phone, but the driver that’s high risk, The Boston Globe. Texting while driving accidents, Breakstone, White & Gluck. 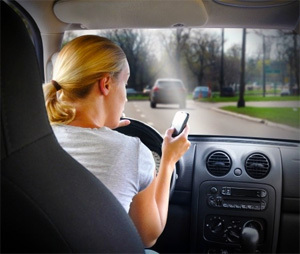 Tagged: "Boston car accident lawyers", "car accidents", "car crashes", "cell phones", "MIT study" and "texting while driving"
Massachusetts lawmakers will consider tougher laws this week to reduce car accidents associated with cell phone use. The Legislature’s Joint Commission on Transportation will hold a hearing Tuesday to discuss several bills. One proposed measure would only allow drivers to use hands-free cell phones. Another would ban drivers from using any type of cell phone within school zones. Just nine states and the District of Columbia prohibit all cell phone use while driving. Massachusetts joins 34 other states and the District of Columbia in banning texting while driving for all drivers. In December, the National Transportation Safety Board (NTSB) recommended a nationwide ban on driver use of portable electronic devices (PEDs) while operating a motor vehicle. The recommendation would ban use of all non-emergency portable electronic devices and the board wants to follow the NHTSA’s model of high-visibility enforcement and focused safety communication campaigns. U.S. Secretary of Transportation Ray LaHood is opposed to including hands-free cell phones in the ban. Texting while driving, cell phone use and other distracted driving behavior causes a large number of car accidents across the country each year. In 2009, 16 percent of fatal motor vehicle accidents involved texting while driving and other distracted behavior. Twenty percent of car accidents resulting in injury involved distracted driving. 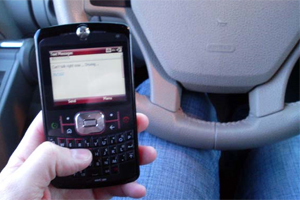 Massachusetts’ ban on texting while driving took effect Sept. 30, 2010. But Massachusetts, like other states, has found its ban hard to enforce. The law bans texting while driving in a moving car, as well as when behind the wheel at intersections. But critics say it is often difficult to tell whether a driver is texting or dialing a number. Another challenge is Americans are sending more text messages than in the past. In June 2011, more than 196 billion text messages were sent in this country, a 50 percent increase from June 2009, according to CTIA, the international association for the wireless telecommunications industry. There is research which shows any type of cell phone use engages a driver enough to create a dangerous distraction. A Carnegie Mellon University study found using a cell phone behind the wheel reduces the amount of brain activity associated with driving by 37 percent. And a study from the Virginia Tech Transportation Institute (VTTI) found that headset cell phone use is not substantially safer than hand-held use. But when drivers text behind the wheel, they are 23 times more likely to get into a car crash than normal, the VTTI study found. Sending or receiving a text takes a driver’s eyes off from the road for an average of 4.6 seconds, which is the full-length of a football field for a car traveling at 55 mph. Read more about Massachusetts’ proposed bans on cell phone use. Read more about the NTSB’s recommendation to ban driver use of ban portable electronic devices.